SLD’s Specialist Air Driven Pumps are extremely versatile, portable, compact units. 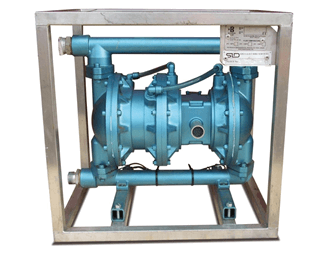 These pumps are capable of a wide variety of applications such as effluent transfer, chemical transfer, hydrostatic testing, mains filling, testing and disinfection, and deep shafts. Industry – Effluent transfer, chemicals, petrochemical and shipbuilding. Civil Engineering – dewatering excavations, deep shafts, tunneling and confined spaces. Water Industry Utilities – Mains filling and testing, mains disinfection, hydrostatic testing. Suitable for some food grade uses or aggressive liquid transfer, with minimum product agitation. Details available on request. Check before use. Suitable for bulk diesel and oil transfer. Will pump water, oils and fuels, viscous liquids and light slurries, (without suspended solids.) Self-priming, can run dry without damage, suitable for high head applications. Good air-handling properties and can provide instant control of flows, by closing off discharge or air supply. Stalls without damage. Air Line Connection: 3/4″ B.S.P. On suction lifts a medium strainer is recommended-an integral strainer can be supplied for submerged operation.